Apartment or Hotel? Which is best? AirBnB rents homes in 192 countries world wide. The business of renting rooms, apartments or whole houses has grown rapidly over recent years. We used AirBnB in Rome and enjoyed a week in a superb apartment near the railway station, shops and main tourist areas. This time we rented an apartment in Antibes, Cote d’Azur and although ok, not ideal. This taught me a lesson to research thoroughly. Although to be fair, this has been the first time I’ve been unsuccessful in gaining an ideal holiday space. The main problem, on this occasion, was location. Antibes is a beautiful town but we weren’t within walking distance of the bars and restaurants. I learnt about the public transport but unfortunately buses stopped running at 9.30 pm. Then I had the brainwave we could walk a mile to the nearby railway station and get a train. However, they were all cancelled due to a strike. Aaaagh. So, we made the best of it and a couple of evenings we just got a taxi home, one evening we stayed in and the rest we went home early. No big deal. The flat was ok but probably more suitable for a millennial. Rather basic, full of storage boxes, which is fair enough, and without enough towels and sheets. We arrived to be told the sheets weren’t dry and only one bath towel each (no hand towels). During the week, Hubby unblocked the sink for the owner and I watered the plants. We found the hose by accident. Instructions were written, in French, on some note paper and the owner texted me (often) during the week, for one reason or another. Location – If twenty minutes away from a town find out whether it is by car or not! If you want to be near bars/restaurants then make sure you are. Check reviews – Work out whether they are valid or concocted by the owner’s mates. Are they written by the same age group, different nationalities and time periods? Room type – Room, whole apartment or entire house? Check to see if it is the owner’s home. This makes a difference as you are likely to have their stuff all around you. Photos of residence – Check them carefully. 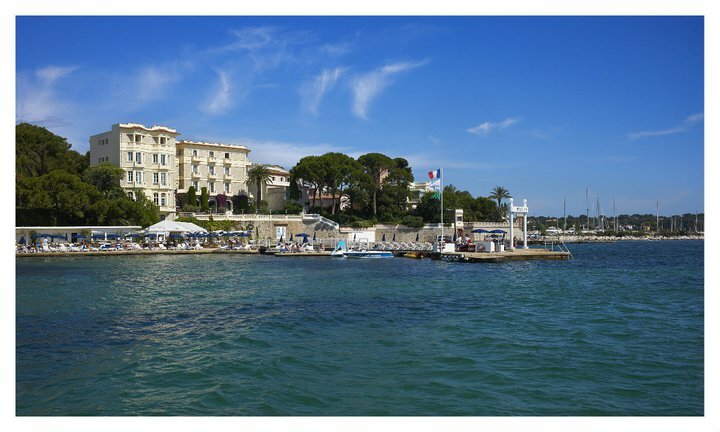 During our first visit to Juan Les Pins, I discovered that F. Scott Fitzgerald lived there during 1925 to 1927. This became the place to stay for the wealthy during the warm summers of the ‘20s and 30s. When I first visited the area I couldn’t believe how much I adored the place. It had a ‘20s feel about it. 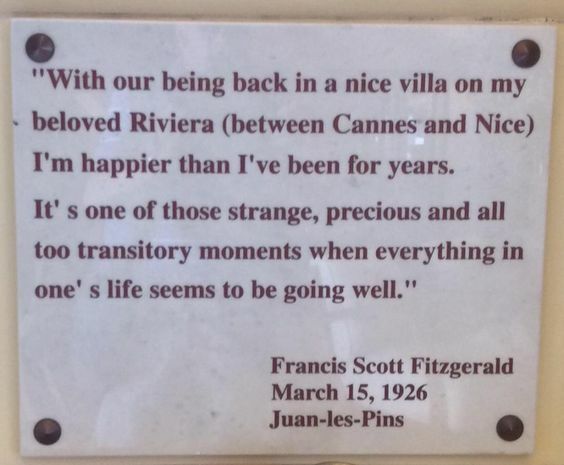 So I looked online and discovered that Fitzgerald had enjoyed living in Juan Les Pins, as described above. 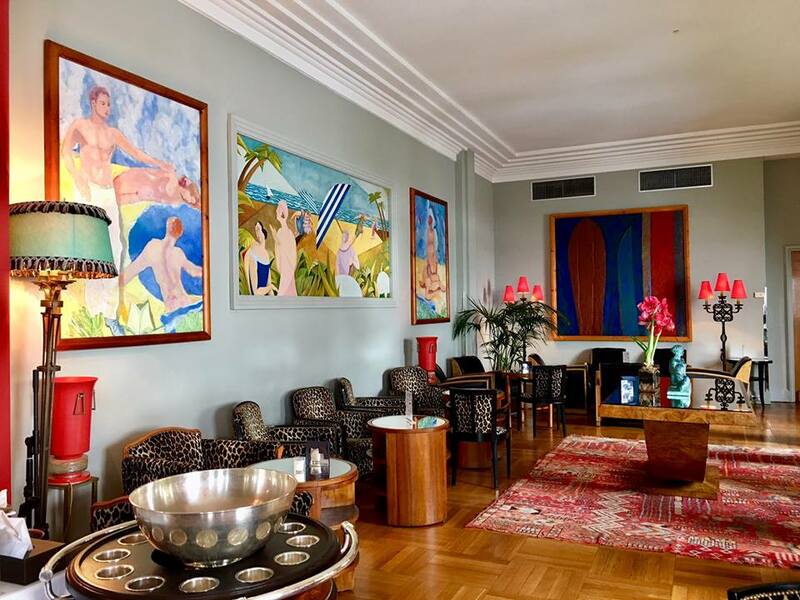 Now I’m not easily impressed but when we investigated, the now Belles Rives Hotel, I was swept away by the beauty of the place. Not normally stupefied by luxury, etc. this was different. I fell in love with the place. It helps that I’ve read all of Fitzgerald’s work and actually adore his writing. It concentrates on an underlying social commentary, rich juxtaposed with poor, but focuses more on parodying society as he explores space, the historical changes of the female and their ensuing relationships and attitudes towards men. He creates a panorama of life by moving from scene to scene, and character to character with no event or character usually standing out from the rest. 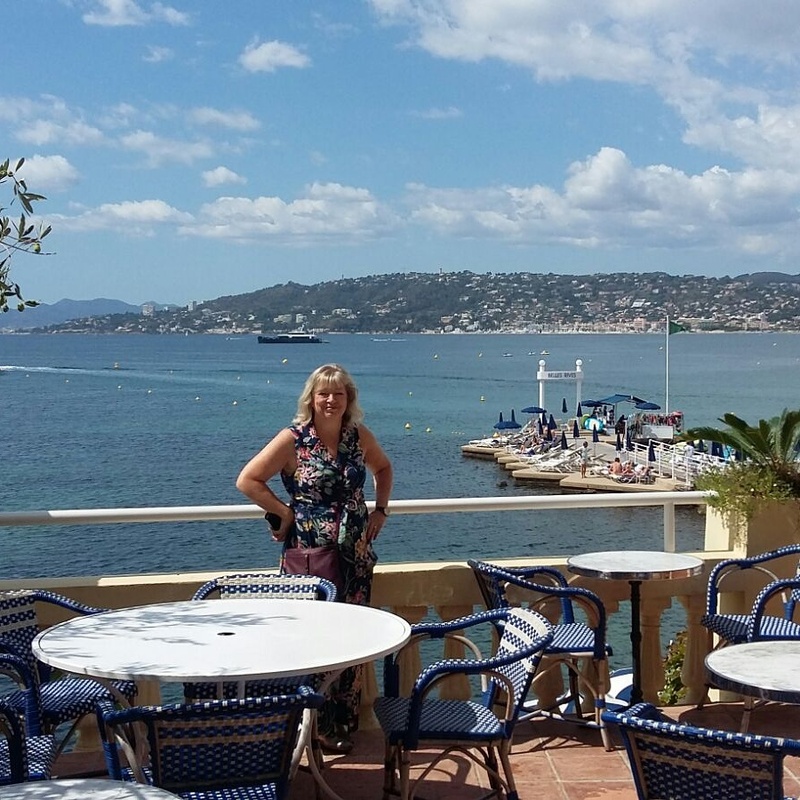 Last year, we went to lunch at the Belles Rives Hotel, and as I was shown to my seat, by the water, I felt quite emotional. The scene before me, as I sat down, was beautiful and captivating. I will never forget that moment. The meal was delicious, the waitress lovely and the food, delicious. This year, we decided to stay for three nights and once again the whole experience was superb. Expensive, but worth every penny. We enjoyed a comprehensive breakfast and on a couple of evenings enjoyed supreme dinners. 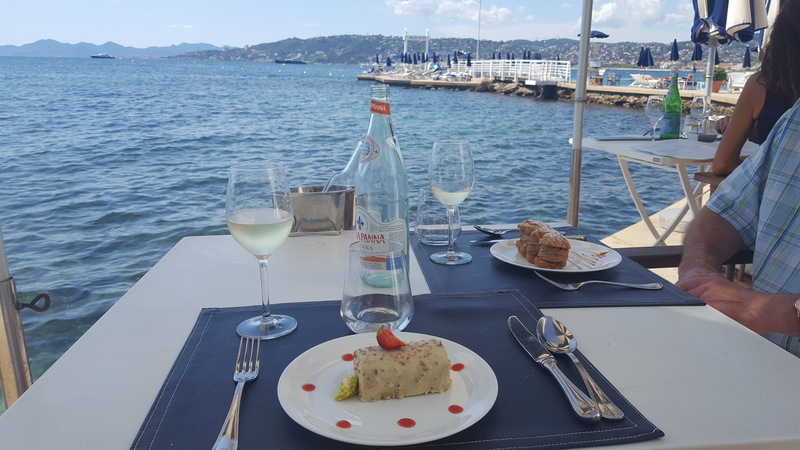 One dinner in their sister hotel, The Juan, and on our final night, a Michelin Star meal in the Belles Rives dining room. The standard of everything is extremely high and it is fun to treat yourself once in a while. The hotel visitors seem to absorb the style and beauty of the splendid house and enjoyed having a special treat. Yes, it caters for celebrity and the wealthy but so what? It manages to keep the original furniture, style and elegance as when Fitzgerald resided there. I enjoyed both experiences. The apartment suits me because I like shopping in foreign supermarkets, buying food and cooking. Recently, I’ve joked about preparing artisan sandwiches for our lunch too. You can come and go as you please or just chill out and relax if you return home early. The hotel is fun too and although ridiculously lavish, great fun to be spoilt rotten. Probably, if you work long hours and want a relaxing break, this may be the best option. However, if you are out and about, then a pack lunch, hire car and your own space, is rather splendid too. All good info to know, but I think I like that hotel best! What magnificence! How lucky are you! So nice to have found you! I love to travel myself although I can’t right now. 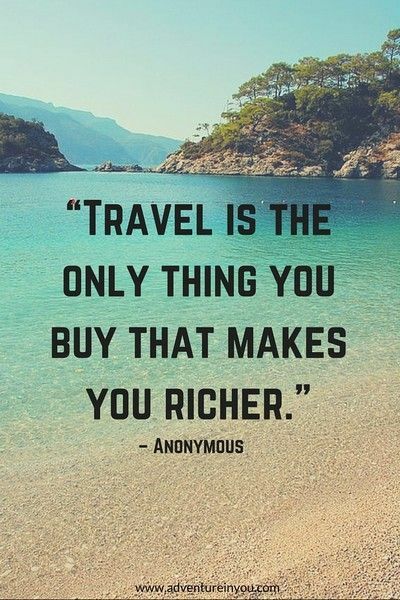 But I have a wish list that’s now growing thanks to your Antibes post!